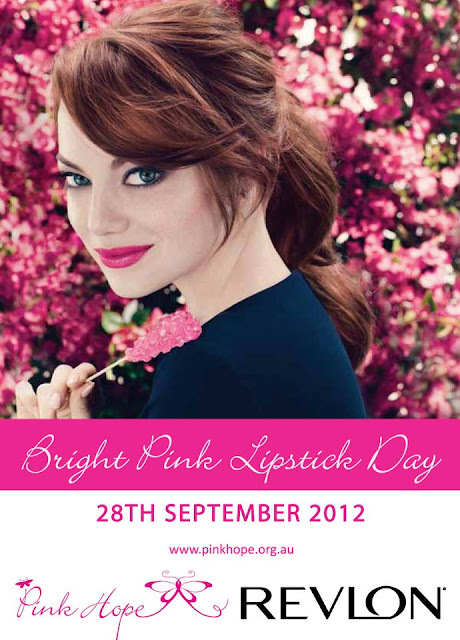 Friday 28th September 2012 is Bright Pink Lipstick Day. As a lover of pink lipstick (the brighter the better) I had to share this great cause with you. Cancer is a serious condition and we all need to be aware of it and raise as much money as we can to help research to cure this disease. Cancer, no matter the type is a horrible disease, I watched my beloved Grandad suffer and eventually succumb to cancer. It is something nobody should go through. I decided to share some of my favourite bright pink lipsticks to give you some inspiration for tomorrow. I LOVE bright pink lipsticks and found it quite hard to pick out only five from my collection to show you (I have many more than 5). I tried to chose lipsticks from different price ranges and different finishes. This is the lipstick Kate Moss wears in the Rimmel advertisement. This is an amazing bright pink lipstick with a satin finish. It is beautifully pigmented and lasts well. It also feels really nice on the lips. It is a steal at $11.95 each. As Revlon is a sponsor/partner of Bright Pink Lipstick Day I had to include a product from them. I love the Lip Butter's they are such an easy way to wear a bright lipstick. These retail for $21.95 each. This is my latest Chubby Stick and I am in love with it. This is really moisturising and provides that subtle hit of a bright lip colour, perfect for those a little shy of bright lipsticks. This retails for $35.00. This is a matte, bright hot pink and perfect for those full of confidence to pull it off. A little more drying than others but a beautiful colour. This retails for $25.00 thanks to Illamasqua's recent price drop (Yay for Illamasqua). I had to include a high end lipstick in this list. After all this is Luxury on the Lips. This is a gorgeous shiny bright pink. It is also quite moisturising on the lips. This retails for $55.00. The swatches above are in the same order as the lipsticks are listed. How beautiful do they all look? Gorgeous I say and that's how they would look on your lips. I encourage you to get behind Bright Pink Lipstick Day, slap on your brightest pink lipstick, spread the Pink Hope message and if you can donate to Pink Hope here. What is your favourite bright pink lipstick? Will you be wearing it tomorrow? Sweet Tart is one of my favorites as well as covergirl spellbound! My favourite bright pink is MAC Impassioned! I love Impassioned but it is more coral on me so it missed out on this list, it would definitely be in my top 5 corals though. I wore bright pink today! Yay! What did you wear?